In 2007 Simon Savidge started sharing his literary obsession with the world, since then he has undertaken various endeavours to spread his love for books and in the process has become a trusted pillar of the literary community. 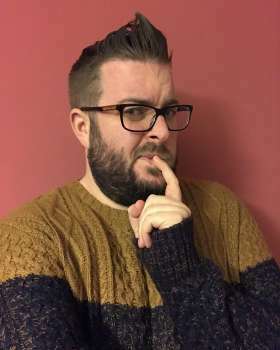 His journey started with his book blog that consistently sat in the top five of the literary bloggers’ charts in the UK, reaching over 40,000 unique visitors a month on top of his 30,000 subscribers. Following this success, he diversified media platforms and along with some fellow bibliophiles created the ‘The Readers’ podcast. The podcasts reach proved global, amassing large audiences in the USA, UK, Canada and Australia. Downloads hit 1 million in the first three years and the podcast is fast approaching its 200th episode. Simon has also created spin off podcasts; ‘Hear Read This’ and ‘You Wrote The Book!’ in which he has interviewed a plethora of writers from Jennifer Saunders to Jung Yun. In May 2016, Simon extended his mission to YouTube, launching his channel ‘Savidge Reads’. In the short space of time since its inception the channel has amassed 12k subscribers and in June of 2018 gained over 1,000,000 views, which is formidable growth in a niche part of the market. Building on his broad experience of the book world Simon founded and ran the Green Carnation Prize from 2010 until 2017. Due to his remarkable achievements in his domain Simon has been previously employed to talent scout for Orion publishing house, has been a judge for the Guardians’ Not the Booker, Fiction uncovered and the Costa Book Awards 2017. He has written for the Bookseller, Waterstones, the Guardian and the Independent and also hosted literary events and festivals across the UK. On top of all this Simon has also had a full time career. In 2009 he joined the team at Bent Magazine, he went on to become their London Editor interviewing artists such as Lady Gaga, Anastacia, the Sugababes, Atomic Kitten and travel features in Italy, Sweden, Switzerland and the USA. He then moved on to Culture Liverpool where he worked on major cultural events such as Liverpool International Music Festival, National Armed Forces Day and other major events across the North West, before taking on Liverpool’s libraries.